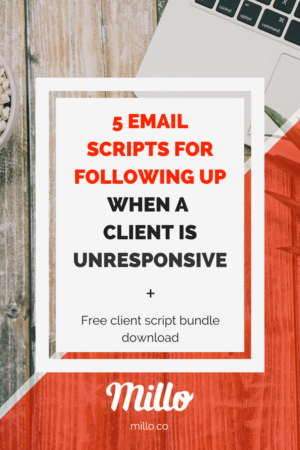 Unresponsive clients can be a real headache…so what should you do when you don’t hear back from a client? This post shares my own experiences and best practices for following up with clients that just won’t get back to you. When sending an initial client intake questionnaire, proposal, contract, initial designs, or anything where you’ve asked a client to take action, you need to follow up if you don’t hear back from them. We’ve bundled our most-requested client email scripts all in one place and made them available here for free. (Normally, we charge $9.) Just enter your email below and we’ll send them right away! 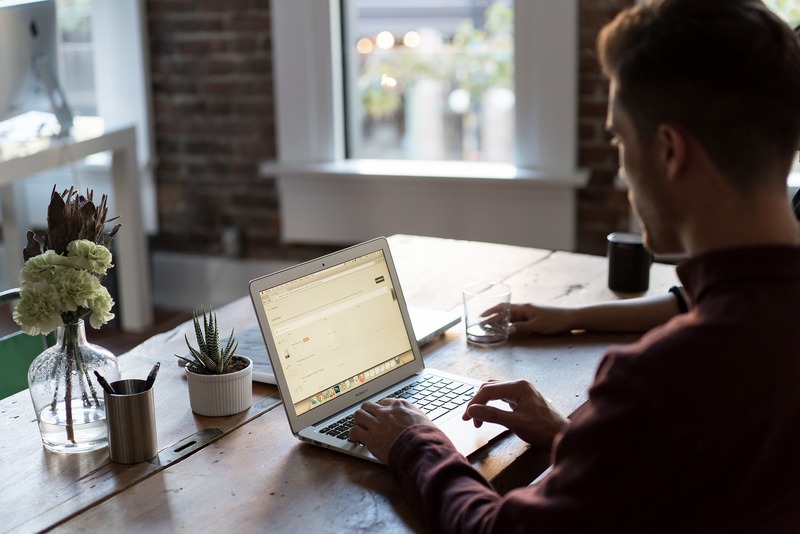 You’ve probably been on the receiving end of a business following up with you and didn’t notice it was an established sequence they were following as part of their operating procedures. A typical follow-up sequence for most businesses is 5-6 emails before moving on if you are unresponsive. You can actually test this. Try it. Sign up for a service or SAAS product demo and don’t respond to any of their follow up emails and see what happens. This will give you an idea of how persistent you need to be and you’ll get a first-hand look at their follow-up sequence. Now if a company that has no existing relationship with you is willing to follow up that many times, it’s a given that you should continue to be persistent with prospects you’ve had some form of actual correspondence with. The reason clients don’t respond to you is that they have other stuff going on. It’s as simple as that. As you’ll see below in an email exchange between myself and a prospect (who’s now my client), they have different reasons why they might not respond. Mostly it’s because they are running a business and have bills to pay, employees to manage, and meetings to attend. You’re not their #1 priority. You’d be lucky to be top 5 on their priority list. So naturally, getting back to you sometimes doesn’t happen. In actuality, I almost always follow up with a prospect after the first interaction before they get back to me. I expect it to be that way and that’s when I use my 5 step follow up sequence. Let’s say a prospect has contacted you. They’ve answered your initial questions about their project, and you’ve put together a proposal and sent it to them. You get silence. No response. What do you do? It’s certainly not the time to do nothing. You need to follow up! 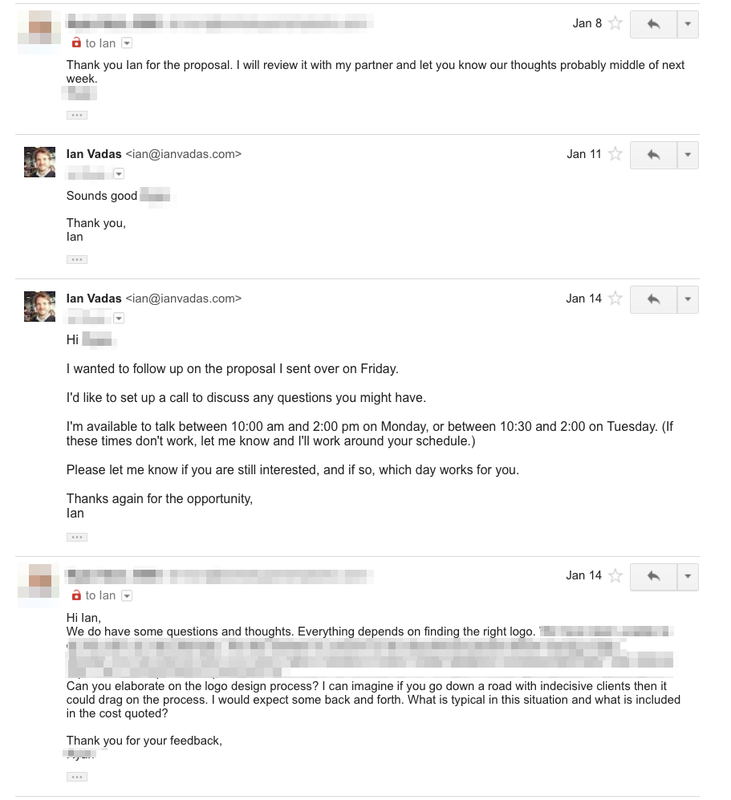 Below are the steps I use to send a proposal and follow up with unresponsive prospects. It’s best to use use auto-reminding software like Freshbooks or Reply. I’ve attached a proposal for you to review. Please look it over and let me know your thoughts. Feel free to ask me any questions about the packages. Pro Tip: Always send an email with a call to action. This keeps the process moving along. In this email, I am assuming they have questions, and I’d like to address those questions by setting up a call with them. Emails with a call to action keep the process moving. Often, they’ll schedule the call. Other times, they’ll respond to the email with questions about the process. Either response is fine. I’ve opened a loop by asking them to set up a call and this email reminds them of that loop. They haven’t responded yet so that loop is still open in their mind and they may be keen to close it. I’ll often get some sort of response from them at this point, but if I don’t hear from them, now is when I start to assume the project is not going to happen. By now the expiration date on my proposal has passed, and they haven’t been responsive. However, I still go all the way to the end of the follow up sequence. Sending this email allows me to move on from any ideas or plans I might have had for this potential project. It’s tough when a project comes along that looks promising because inevitably, as a designer, you start to create a vision for the project. Closing the loop on the project allows me to put that vision to rest so I can move on and stop wasting my time thinking about it. You can download all these scripts plus 10 more scripts completely free by entering your email below. Below is real email exchange that shows how this can play out. You’ll see the prospect didn’t respond until I followed up with them using one of the scripts above. It is so common for them to not respond right away that I always assume I will need to follow up. I expect it. Notice the dates. I sent an email with the proposal, and the prospect’s first response was to confirm receipt of the proposal. That was late on a Friday evening, so I didn’t send my email (Jan 11) until Monday morning. 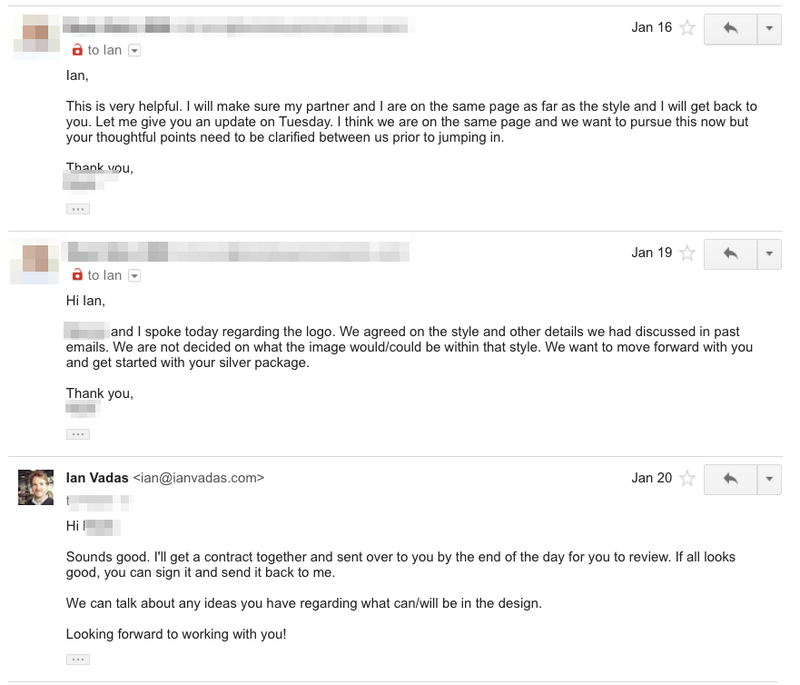 After 3 business days (Jan 14), I sent him the follow-up email asking to set up a call. You can see how this process can take a while. It could have been sped up if he decided to take the phone call appointment with me, but he’s a busy guy and always answered my emails late in the evening after work. Not surprisingly, his #1 priority is his business, not me. You can see here that you have to be patient, but also keep the process moving along. Had I not followed up, it’s possible I would have never heard from him again. The one thing you can do is get your follow-up sequence in place. Go with the expectation that you won’t hear back from a prospect on the first pass and the next time you send a client a proposal and don’t hear back, you’ll be ready for it and know what to do next. Try setting up autoresponder sequences using Freshbooks, ConvertKit, or Reply. Then download the free email script bundle below, edit for your clients’ needs, and plug them into your software of choice. What are some ways you deal with unresponsive clients? Let’s hear it in the comments below. our client email scripts bundle (a $9 value) for FREE using this link. Prospects who disappear after receiving our proposal is very common among freelancers and often discussed. I think a 2nd or 3rd follow up email would be enough for me. I don’t want to be pushy, because in my case, 90% of the prospects who don’t respond, they just don’t have the budget. And many of them feel uncomfortable to admit it. Thanks Maria! Yes, working with the right clients is even more important than following up. It’s one of those things where you do it right in the beginning or all the other tactical stuff down the road becomes irrelevant. If you are working with the wrong people, following up with them is not going to help your cause. So what I do is first send a client questionnaire with a minimum budget amount on it. That way, if I’ve gotten to the point of writing a proposal for them, I know they at least meet the budget requirement. The reason I go all the way to the end of the sequence is really just to get it out of my head. At the point of sending them the Closing The Loop email, I am just looking for closure for myself so I can move on. I do something slightly different by reaching out later on down the road. About 6 months down the road I reach out and open a new loop by asking if there is something they need help with. If the timing is right, they may decide to respond and resurrect the old proposal or start a new proposal. Question for ya, though. I have a long-standing client that has been wonderful. One of those that you don’t want to lose. We have done several projects for him over the years. Recently we proposed ongoing marketing services/social media management. I sent him an email outlining the basics of what we would do and a starting price range to see if it was in the ballpark of what he was thinking. He never addressed that email, but we have interacted several times since then about other projects or questions he had. I specifically asked about it multiple times, but he still never responded. I do not want to chance being pushy since he is such a good client, but at the same time I really want to know if he is still interested. Any advice on how to gingerly approach it would be great! Good question. Well, does he still have a need for ongoing marketing services/social media management? If he does, I don’t think it is pushy to ask about it. If you ask about it showing you are genuinely curious and interested in helping him and his business. So I would ask from his perspective. Instead of asking about the proposal, ask if he still has the problem that was the genesis for the proposal in the first place. It could be the timing is not right. It could be that he has other more pressing issues. I would simply try to have a conversation about his business with him to get a feel for what situation he is in. From there, you can figure out if it is still a priority or not. The budget matter is probably less important if you have worked with him in the past and those projects were in the same or similar range as what you proposed. If so, then you know the money if there. The goal then becomes more about showing him that social media management and ongoing marketing management is important because it will help grow him brand, free up time for him to focus on things that he does best, etc. The article is good and indeed very very helpful especially as a reminder to follow up and offer that tiny bit extra in conversation. I did feel the 4th and 5th email is a bit cold in its words. Do you have a suggestion to deliver the same message in a better tone? Great article and great advice, especially for newbies. I find it can be tricky getting the right tone over email and being confident, but not sounding bossy. I found your “I’ve attached a proposal for you to review. Please look it over and let me know your thoughts” a little pushy/bossy. If you’ve had success with that perhaps I should try it! I’m just very sensitive to being told what to do! I do tend to assume if I don’t hear back by 2nd or 3rd email that the client (or potential client) isn’t interested, but perhaps a bit more persistance is needed. Thanks so much for this! I don’t always remember to follow-up, which is why I got Boomerang to keep track of all the emails I send. Thanks for your great help regarding following up old clients, but how to get new good paying clients? What’s your strategy for this part of getting new business? This is what my client replied after step 4 of my email. “I don’t think it’s any of your business to question my priorities, I am a client to you, you have given your proposal i will respond at my convenience. We are busy with other things, you are at your liberty to engage yourself. Wow! Sounds like not an ideal client for you. I believe clients should be partners, and if they don’t care about the fact that you’re taking the time to follow up AND “saving space” to ensure you can meet their needs, then that doesn’t seem like a good long-term client relationship! How’d it turn out? Great article but I have a tricky one for ya . . . I contacted a company (Well funded as in 8 figures). I met there Marketing Director, we had a great chat. He suggested to make a proposal and then we can all discuss it with the CEO. Two days later I sent him the info he needed, no response.. 1 Week later, I followed up, no response. 2nd time I followed up no response. 3rd time, I followed up with your message above lol “Is this project still a priority for you? . . ” – That one and I added ‘tracking on it’. Just to see if he will open it. So he opened it but again, no response. I”m assuming that I’m in the running and they are just weighing in on other options as well (Originally they were looking for someone in-house). Funny thing is I have a meeting with a prospect who are in the exact same market as these guys tomorrow. So if I like them, and things work out, I won’t be able to work with them regardless. PS: Great site by the way. I usually remind them three times via email spread over 2 weeks. they were just busy . They sometimes just need time. I have a client who asked me to work on 15 units of 3D rendering job for $30 each. The deal was a done deal. The client was happy with the output. One month later, the client has contacted me again to work on 120 units of 3D Modelling and Rendering task. He asked me to give him a quote. The new task were a mixture of complicated and easy objects, and after careful analysis to the new project scope, I decided to charge the same amount per piece as our previous deal. After I submitted the quote, the client did not reply back. There is no word from him at all. No bargaining whatsoever. Where did I go wrong? It has been more than a month since I submitted the quote. Should I still follow-up? Yes, definitely follow up, Kristian. You’ll never know what’s up unless you reach out to them. How would you respond to this email? keep in mind that we trat all of our clients with the same priority… i guess he doesnt want to pay us all..
“Sorry for the delayed response as I have been dealing with some personal issues for an extended period. I have been meaning to write you earlier but have not found the time. I am back working now. I am going to be quite forward in this email as I have been a client for a very long time and have always been satisfied with your firms work. You have been my lawyer in Mexico since day one and have been a great value to my endeavors as well as my fathers and for that I will be forever grateful. However, since the merger with Dentons there has been a major change in the quality of services and a lack in the attention to detail your firm has provided. I know your focus is on bigger accounts and that an account like mine will take a backseat but I did not anticipate such a drastic change. There have been some notable issues that I would like to highlight. For over a year there have been a revolving door of junior associates that were accompanying Dante to our meetings and they weren’t versed and in most cases briefed about the items I was going over with Dante (this list of items has been static for over a year). Since they weren’t familiar with what was being discussed there was little value added by their presence and this resulted in a waste of time/money. Additionally, I have been trying to resolve the same issues (a court releasing money to Cosafi as the result of an appeal where the has been a simulated workers claim taking a lien on the money) for almost a year and was hitting my head on the wall trying to think of ways to solve these issues. There has been no creativity or thinking on the firms side as to how to resolve the issues. The ideas on resolving issues were solely coming from me and then the feasibility would be analyzed by your lawyers. I expected more from your lawyers in way of coming up with solutions rather than evaluating my proposed solutions. I know the counter party is a difficult counter party but since I have had other lawyers working on this that provided an avenue of options never brought up or discussed by your team. The biggest item that I took exception to was not being informed that Dante had left the firm. In the past I was always advised of changes to my legal team and was particularly advised if there would to be changes to my relationship manager. Regarding your fees I will make a payment next week and hope to have the balance paid by Christmas. I kindly ask that you reconsider some of the fees of your jr associates that accompanied Dante to these meetings (for the above reason).